The Boyesen Power X-Wing is the simplest, most economic way to maximize the power and efficiency of your HD’s intake. See the benefits of releasing the pure and simple potential trapped in your bikes engine. A NEW TYPE OF POWER, PURE AND SIMPLE – Guaranteed! 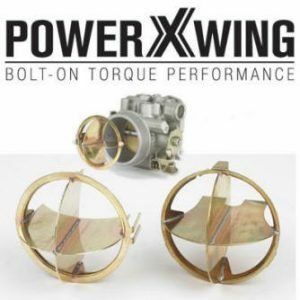 In order to understand the benefits of the Power X-Wing, you need to be aware of the importance of air velocity and how it relates to your engine’s power. As air velocity (speed) increases the more viscous (dense) it becomes, causing the air to display characteristics which are more like a fluid. The effective air velocity creates an action known as fuel shearing, splitting the droplets of fuel into a finer gas like mist. With the two different substances becoming more like one another, we achieve a superior homogenous air/fuel mixture. We know that with a uniform saturation of air and fuel, a superior and more efficient combustion will result. Lets talk about Volumetric Efficiency: a measure of how well an engine breathes. Usually expressed as a percentage; For example if an engine is said to be 85% volumetric efficient (at a specific rpm), then it is ingesting a volume of air that is 85% of what it would achieve if the cylinder were allowed to fill completely by the force of atmospheric pressure. We should remember the importance of volumetric efficiency and its role in an engines ability to produce torque. In fact, volumetric efficiency and torque output are virtually the same as it relates to RPM. Simply put, air and the velocity it can generate is the most important part of the performance equation. The Power X-Wing increases air speed (velocity) at all throttle settings. It does this by directing what comes through the air filter into the carb/throttle body. That air becomes very turbulent when it passes through the filter and therefore the blades of the Power X-Wing extend out into the filter space to guide and direct what comes towards the bell of the carb/throttle body. As this air is guided into the throat and bore, the Power X-Wing starts to straighten the air through its four channels and walls, effectively minimizing turbulence. As the incoming air becomes less turbulent, the molecules are calmed down and take up less volume. Therefore they come closer together, producing a denser charge. This charge also increases in velocity, because stable and less turbulent air has less friction when it moves at high speed. Furthermore, the air, which is now more laminar (smooth) in flow, is better able to pass the butterfly and shaft barrier, which especially has the effect of improving velocity going into the engine. This is especially true at part throttle, because then the four channels become more like individual velocity stacks. These stacks at smaller throttle openings create a greater proportional increase in velocity when compared to standard. Now that we realize these kinds of gains in velocity, the cylinders are filled more freely. With high velocity and dense laminar flow, the air increases its ability to shear the fuel droplets and therefore improve atomization. By this method the combustion process becomes more efficient, complete and effective, producing better torque and power. Even better fuel economy. The improved and increased performance has been demonstrated on the dyno and by radar tests. Less obvious to the reader are the kinetic energy gains in a running engine. Because of the superior cylinder filling efficiency, less drag is sensed by the crank as the intake stroke happens. The result of this phenomenon allows the crank to gain more momentum to turn faster for smoother power delivery, better throttle response and stronger acceleration. Now picture a motorcycle being driven down the highway, the throttle being held partially open to maintain a constant speed and rpm. At this constant rate one could measure the volumetric efficiency (how the engine breaths). For example, at a given throttle position, the engine will produce road torque to maintain the motorcycle speed for the driving conditions. Now, picture the same conditions, except we installed a Power X-Wing, which changes the engines ability to improve net airflow. We induced a modification that creates effective velocity and improves volumetric efficiency. Because of this improvement, the engine will require less throttle opening to produce the torque required to maintain the same motorcycle, at the same speed, for the same driving conditions. We have created a condition that leads to a more effective combustion. Having said all this, the Power X-Wing has the ability to create an effective air velocity that initiates a homogenous air/fuel mixture into the intake tract. This produces a more volumetric efficient engine for an increase in torque, horsepower, throttle response, acceleration, and fuel economy.